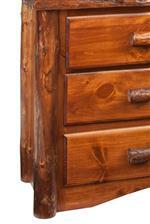 Give your bedroom a beautifully rustic, alternative storage option with this four drawer log chest. The piece features a set of natural log legs and a vibrant finish that expertly highlights in the intricacies of the wood's grain. As storage goes, you receive four spacious drawers for your clothing and accessories, making for both a stylish and functional piece to cherish for many years to come. The Legacy Bedroom 4 Drawer Log Chest by Wildwoods at Conlin's Furniture in the Montana, North Dakota, South Dakota, Minnesota, and Wyoming area. Product availability may vary. Contact us for the most current availability on this product. This collection of bedroom furniture will give your home a beautiful rustic atmosphere, while also providing some functional storage. With natural log features and detailed wood finishes, it'll be like transporting your home to the wild Wisconsin Northwoods. The Legacy Bedroom collection is a great option if you are looking for Rustic furniture in the Montana, North Dakota, South Dakota, Minnesota, and Wyoming area. Browse other items in the Legacy Bedroom collection from Conlin's Furniture in the Montana, North Dakota, South Dakota, Minnesota, and Wyoming area.